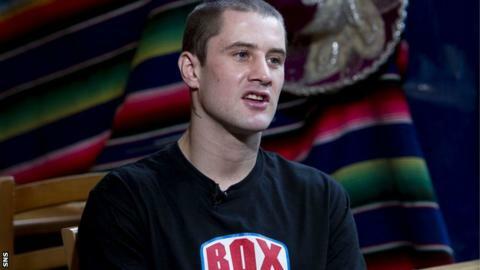 World lightweight champion Ricky Burns says he is preparing for his biggest ever fight in "sub-zero temperatures". The Scot will put his WBO title on the line in a unification showdown with IBF champion Miguel Vazquez in London on 16 March. And the Coatbridge fighter has been training in Norway. "I was sparring and training over there and that involved a lot of running," said Burns. "I'm a man who likes the heat, so it was a big adjustment." The winner of Burns' match-up with Mexican Vazquez will unify the WBO and IBF titles. Burns, 29, can boast 35 wins from 37 fights and is three years older than his opponent. However, Vazquez's record is similarly admirable, having won 33 of his 36 bouts. ''I know all about Vazquez and what type of fighter he is, he's a lot like me," Burns told BBC Scotland. "But with every fight I am getting more aggressive. "I just can't wait to get back into the ring as I haven't fought since September. ''It's the biggest challenge of my career but I look at every fight as equally important. "I don't think of what each one means in terms of historical importance." Also expected to appear on the Wembley Arena card are Nathan Cleverly, George Groves and Dereck Chisora. Welshman Cleverly joint headlines the bill and will put his WBO light-heavyweight crown on the line against Serbia's Robert Krasniqi. Groves will be aiming to add the vacant European super-middleweight belt to the British and Commonwealth belts he already owns when he fights Italy's Mohammad Ali Ndiaye. And heavyweight Chisora will be hoping to get his career back on track after a defeat by David Haye in July. "All the fights on the show are really, really good fights and I think the boxing fans are in for a real treat," added Burns.